The Market at Gus’s carries only the best in deli meat offerings, including Boars Head. In addition there are over freshly-made salads created on-site every day. Our dedication to quality is evident in offerings like our chicken salad, made exclusively from breast meat which is poached (not boiled), pulled (not diced), and then mixed with Hellman’s Mayonnaise and fresh ingredients. 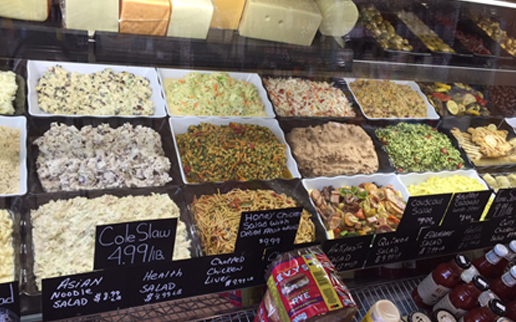 Top it off with hot dishes prepared daily and you’ve got it all covered when shopping at our Deli. Love to eat well, but don’t have the time or interest in cooking? The Market at Gus’s has the answer. Every day, professionally-trained chefs prepare several dishes of restaurant-quality entrees and side dishes. How about the best lasagna (meat or vegetable) in town? How about Chicken Parmesan, Italian Meatballs, or Eggplant Parmesan? All of this and a whole lot more, prepared and waiting for you at The Market at Gus’s at a fraction of what you’d pay in a restaurant. Whether you’re eating alone or feeding the family, The Market at Gus’s is there to provide you with memorable food at a reasonable price. Both our Deli and Prepared Foods departments are sure to ignite your taste buds. Come visit us and see what The Market at Gus’s has to offer. From social events and corporate meetings to weddings and other special events, The Market at Gus’s features a full catering menu for your enjoyment. The Market at Gus’s is enthusiastic and devoted to providing bold, brilliant, and delicious food items for your events. Let us do the cooking so you can enjoy the party! Please contact our Catering Department at 914- 835-5321 or by email orders@gusseafood.com for all information pertaining catering for your next event.